All of us at Washington College were greatly saddened to learn of Finn Caspersen's recent death. During the five years I have served at Washington College, I have been reminded almost every day of the enormous impact that support from The Hodson Trust has had on the health of this institution. Everywhere I look, I see buildings that could not have been built, students who could not have studied here, and programs that could not have flourished without Finn Caspersen's help. When Finn and the other members of the Board were on campus in June of 2007, I was proud to show them how the College has improved with The Hodson Trust's support. To list everything that Finn Caspersen made possible for us would require many pages, but I would like to touch on just a couple of highlights. The Trust contributed to the establishment of three endowed faculty positions: The Hodson Trust Professor of Economics, the Louis L. Goldstein Professor of Public Affairs, and the Joseph H. McLain Professor of Environmental Science. Finn Caspersen and The Hodson Trust assisted us in the construction of three major college facilities: Hodson Hall, the Lelia Hynson Boating Park, and the John S. Toll Science Center. The Trust helped us establish student scholarship endowments (as well as the Hodson Middle Income Loan Fund) including The Hodson Trust Merit Scholarships, The Hodson Trust Minority Scholarships, and The Hodson Star Scholarships. 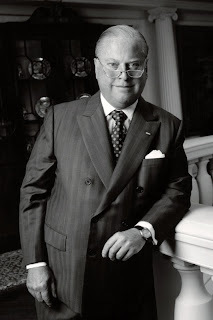 Under Finn Caspersen's leadership, The Hodson Trust invested in numerous signature College programs: the Douglass Cater Society of Junior Fellows, the rowing endowment, and the C.V. Starr Center for the Study of the American Experience. 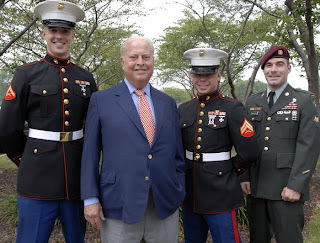 Washington College's first Hodson Trust Star Scholarship recipients gather with Finn Caspersen, Chairman of the Hodson Trust (left to right): Lance Corporal James H. Schelberg, USMC; Finn Caspersen; Corporal Charles P. Grigg, USMC; Wilhelm Gundlach, USA. In 1999, Finn Caspersen announced that the College could use its annual distribution from The Hodson Trust to match, dollar for dollar, campaign gifts of $100,000 or more to endowment funds. At the conclusion of the Campaign for Washington's College, gifts for scholarship funds, internships, and endowed chairs totaling $11,443,443 were matched by The Hodson Trust, generating almost $23 million in new endowment. The Hodson Trust Star Scholarship program, inspired by Finn Caspersen and established in 2007 as one of the first such initiatives in the nation, added impetus to the movement that ultimately led to the Post-9/11 G.I. Bill. It has been almost thirty years since Washington College awarded Finn Caspersen the honorary degree, Doctor of Humanities, on May 17, 1981. That award, the highest we can confer, was in recognition of service already rendered. His service over the past almost three decades has been just as extraordinary. We thank him, and we will miss him greatly.